Srila Gurudev showered mercy on the San Jose Seva Ashram on Saturday. He arrived at 9am and sat before Sri Gauranga Sundar Mahaprahu in the Victorian-style temple room. About 40 devotees gathered around His Divine Grace and received His affectionate smiles and invaluable darshan for over one hour. We were also blessed with the association of many other saffron-clad servitors: Sripad Janardan Maharaj, Sripad Goswami Maharaj, Sripad Avadhut Maharaj, Sripad Siddhanti Maharaj, Sripad Akinchan Maharaj, and Bhakti Lalita Didi. Kum Kum Didi, the manager of the Ashram (which is primarily run by women), warmly welcomed all of the guests and Srila Gurudev expressed a special appreciation for her service. "Kum Kum Didi is serving Mahaprabhu very happily," he said. "Her invitation is so glorious and so fortunate for us. She has given us new life. I am very happy with her divine service to Srila Guru Maharaj." 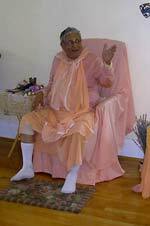 Srila Gurudev said that in the West, the ladies are "the main practitioners." He also gave praise to the other women who are caring for Sri Gauranga Sundar and running the ashram, particularly Jivana Didi, Uma Didi, Divya Shakti Didi, Deva Priya Didi, Braja Mohini Did, and Bimala Didi. He added, "When devotees are fully dedicated, how much power they have we cannot believe." Then His Divine Grace began a heartfelt discussion about the special manifestation of Sri Gauranga Sundar, as he appears by himself in this ashram. In the tradition of Sri Chaitanya Saraswat Math, started by Srila Bhakti Siddhanta Saraswati Thakur, Sri Radha, Krishna and Mahaprabhu are manifesting together in most of our temples. But alone, Mahaprabhu is tasting "super-ecstasy" in his pastimes with Ramananda Ray and Swarup Damodar. Srila Gurudev explained that Srila A.C. Bhaktivedanta Swami Prabhupad preached Krishna Consciousness widely in the West, and in many ISKCON temples, Mahaprabhu appears with Nityananda Prabhu. Mahaprabhu has two preaching styles: one is with the external appearance of a devotee, spreading Harinam Sankirtan, and in this way, so many fortunate souls have received the Mahamantra from Nitai Gauranga. Mahaprabhu also shows another preaching mood. He wants to taste Sri Radha's mood of separation and the ecstasy of her divine love for Sri Krishna. She is the dearest servitor of Sri Krishna. "That is Mahaprabhu's internal manifestation," Srila Gurudev said. "Guru Maharaj entered into that internal world." Srila Gurudev went on to explain that even though we may feel unqualified, Mahaprabhu told us that if we take the Hare Krishna Mahamantra in our hearts, by His blessings we will be qualified. The ultimate conclusion of the scriptures, he said, is to chant Hare Krishna and be happy. During Srila Gurudev's amazing discourse, I was trying to relish every word and held my breath in disbelief that I was so lucky to be there. His voice sounded strong and clear while he was speaking about these deep topics. Finally, he closed by giving us even more encouragement. "All of the devotees are my inspiration," he said. "Their enthusiasm is very good. Their association is giving me more and more life. For that I have come." Indeed, he has given all of us in California more life with his merciful visit. I feel more enlivened in my attempt at service. I ask all of the devotees to forgive any errors in this report and to please forgive my tardiness in writing about the events here.